In 2000 my book “The Language of Gifts” was printed and is still available on amazon.com. This is the reference for my material on this blog. The book is a dictionary of the symbolisms of items throughout the world and time. It’s chapters divide up the motifs of: Animals, Flowers, Gemstones, Household Items, Mythological Creatures. And then includes the added “adjectives” of Color, Shape, Body Part (don’t laugh, it is very helpful!). 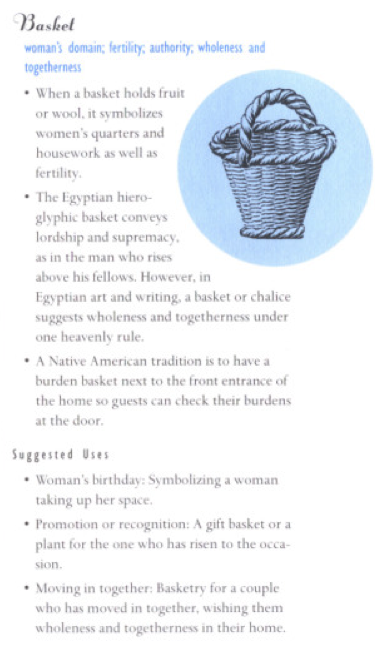 It includes notation of where in the world the symbolism is drawn from, and then suggested things to write in the card when giving a gift of that motif.